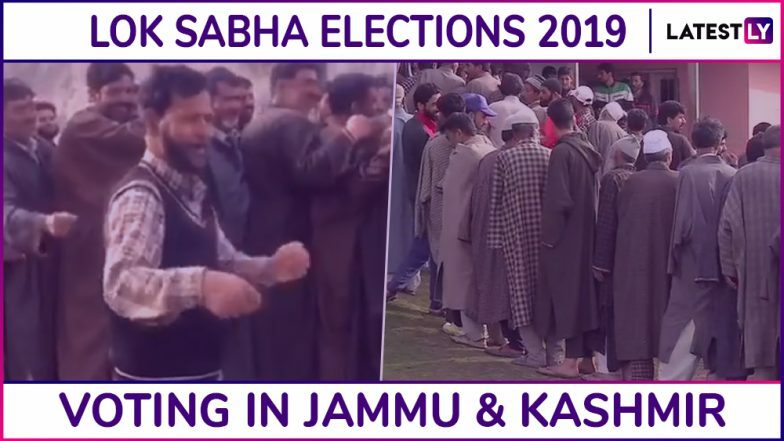 Jammu, April 5: Voting for the first phase of Lok Sabha Elections 2019 took place in two constituencies of Jammu and Kashmir today. Polling began for the Baramulla and Jammu Parliamentary seats on Thursday, April 11, at 7 am and ended at 6 pm. The two seats in total recorded a voter turnout of 54.49 per cent. A large number of voters were seen turning out on polling booths for both constituencies. The video of a voter dancing outside a polling booth in Bandipora was going viral on social media. Security was tightened in both the constituencies that went to polls today. A total of 33,17,882 voters were expected to cast their votes in the first phase in these two constituencies in Jammu and Kashmir. The state also has 47,155 service voters in the first phase. Jammu And Kashmir Lok Sabha Elections 2019 Dates: Constituency-Wise Complete Schedule Of Voting And Results For General Elections. Voting was held across 4489 polling booths spread across these two constituencies. Voting took place through Electronic Voting Machines and VVPAT machines were also been placed at every polling booth. aramulla Lok Sabha Constituency in Jammu & Kashmir: Candidates, Current MP, Polling Date And Election Results 2019. A total of 33 candidates were in the fray in these two constituencies. In Baramullah, the key candidates are Mohammad Akbar Lone of National Conference, Abdul Qayoom Wani of the PDP, Haji Farooq Ahmad Mir of the Congress and Mohd Maqbool War of the BJP. In Jammu, the key candidates include Jugal Kishore of the BJP, Raman Bhalla of the Congress and Badri Nath of the BSP. Jammu Lok Sabha Constituency in Jammu & Kashmir: Candidates, Current MP, Polling Date And Election Results 2019. Voting for the Lok Sabha Elections 2019 will take place in seven phases. While the first phase of voting is being held today, the last phase of voting will take place on May 19. In Jammu and Kashmir, voting will take place in the first five phases. The counting of votes will take place on May 23.